August is, as you may know, Women in Translation Month—a broad based initiative to promote the reading of translated literature by women, hosted by Meytal Radzinski. Anyone and everyone is welcomed to take part in any way, large or small, to help celebrate, promote, or explore translated works by women writers. This month I have several significant reading projects that involve writers that, if in translation are not female, or if female are not translated works. However, I have, as ever, made a selection of titles to choose from with the hopes that I will be able to work at least a few in over the weeks ahead. Being a painfully slow reader, and an even slower writer, I have been careful to keep all potential contenders at or below 200 pages—sometimes well below 200 pages. From the books pictured here, Carmen Boullosa’s Before and Magdaléna Platzová’s The Attempt are at the top of my must read list for this year’s WITMonth. I will be happy to manage to fit in four. 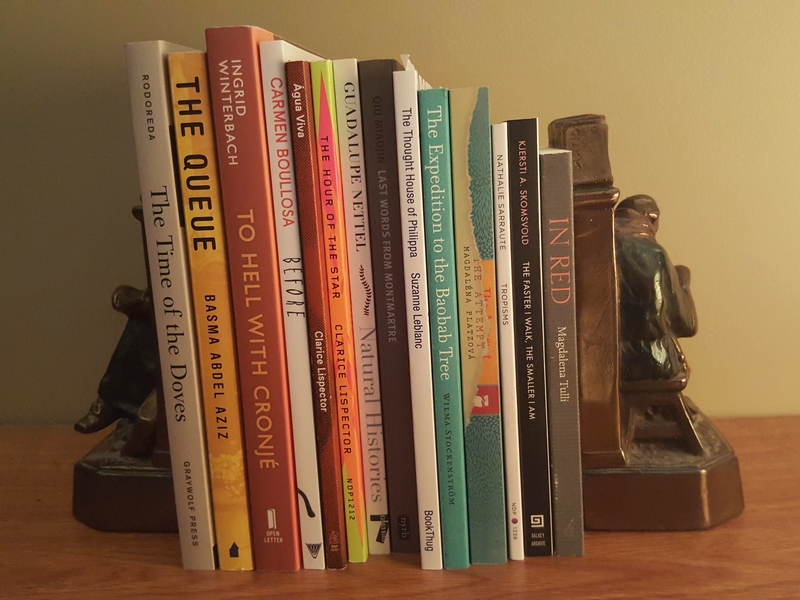 This modest collection includes works originally published in Afrikaans, Arabic, Catalan, Chinese, French Canadian, French (France), Norwegian, Polish, and Portuguese. And, of course, I reserve the right to choose something not pictured here, but I don’t want to let the month pass without honouring this worthwhile, and important, project. I love your book stack here, so much. Both those Lispectors are absolute favorites of mine, and I read a different Ingrid Winterbach that I loved loved. I’ve been meaning to read the Kiersti Skomsvold for some time now. I’m going to enjoy reading your posts on these books, and am putting together a list of my own for the month! Thanks Michelle. It’s ambitious and a 700 page book arrived today that I’ll be writing about for a publication. That’s why page number may be the selective factor. And I reserve the right to read something else altogether. . . it’s just fun to make lists! Which Winterbach did you read? The Elusive Moth? That is one of my favourite books ever! So I read To Hell with Cronjé – I don’t know why I didn’t remember the title. But just looking through my lists, saw that it’s the same one you’ve got listed. It’s very very good, I must say. Reminded me in many ways of Cormac McCarthy. But I will search out The Elusive Moth! Loved “Last Words from Montmartre” & I think you would too. A great list of selections Joe, I look forward to your thoughts. I’d read it, as we know of her demise it is hard to not read it as an extended suicide note, but it is a very moving plea. It made my “top 12” of 2015 & I often reflect on it. I brought the bookends back from my father’s office. I’ve used them as props though at the moment they are employed as intended. Watch for them, chances are you’ll see the monk in the library somewhere along the way! Nice looking pile of books! I’ve read The Queue and thought it was excellent! I haven’t read a female Arabic author yet so this does look interesting. I’ll see what I manage to fit in! The only one I’ve read is the Rodoreda – but a different translation. I’ve just read another of her novels for this month. I’m also planning a Carmen Boullosa, but again a different one. Whatever you read, I look forward top reading about it. I saw your Rodoreda review today. I’ve read War, So Much War and have her last book, but have always wanted to go back and start with this one. I have two Boullosas as well but this one is slimmer! Page number may be the filtering factor this month! Thanks Stu. Hope I get to a few of them. And I have just ordered another one to add in! Great selection! I will be reading The Empress and the Cake by Linda Stift and Waking Lions by Ayelet Gundar-Goshen but haven’t decided on any others yet.